Orzo cooks in 15 minutes, and when done ‘risotto’ style is a bit sticky lending itself to a making a crust. I used salami, but pepperoni, ham or chicken would also be good. Put orzo and stock in small saucepan and bring to a boil. Cover and cook until orzo is done and stock absorbed, about 15 minutes. Remove orzo and spread on a plate to cool for 5 minutes. Lightly oil a 9 – 10″ (22 – 25 cm) pie or quiche plate. Add 1/4 cup cheese and the orzo. Mix well. Remove crust and spread tomato sauce evenly over the top. Spread onions and peppers over the tomato sauce. Lay the salami slices on top. Sprinkle with olives and herbs. Return to oven and bake for 20 minutes longer. Remove, and let rest a minute. Cut and serve. 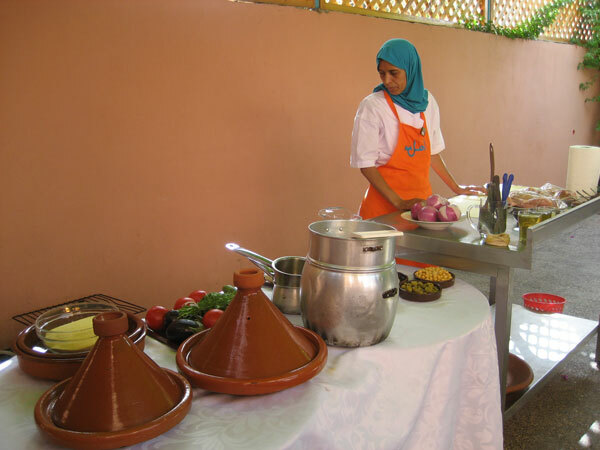 Since we are a family that loves good food it was only natural that we have a cooking class in Marrakesh. We spent a fantastic few hours, cooking and eating, at the Amal Women’s Training Center and Moroccan Restaurant. 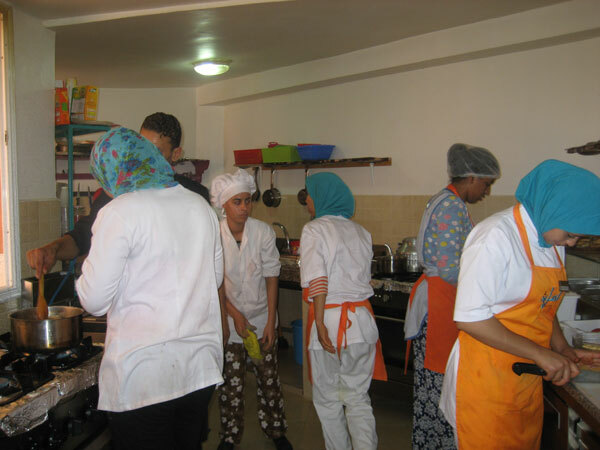 In their words the Amal Center is a non-profit association dedicated to the empowerment of disadvantaged women through restaurant training and job placement. We were given a tour and information about the center before our cooking class started. The center was started in 2012 by an American woman, Norah Fitzgerald, born in Morocco. The purpose was to help disadvantaged women – women who are divorced or widowed or single mothers or kicked out of their family home with no skills and living on the streets. The restaurant serves app.100 lunches each day as well as caters a local school lunch program and has a small but popular bakery. There are 15 employees and 15 students and they accomplish all of this in a rather small kitchen and a sunny courtyard. 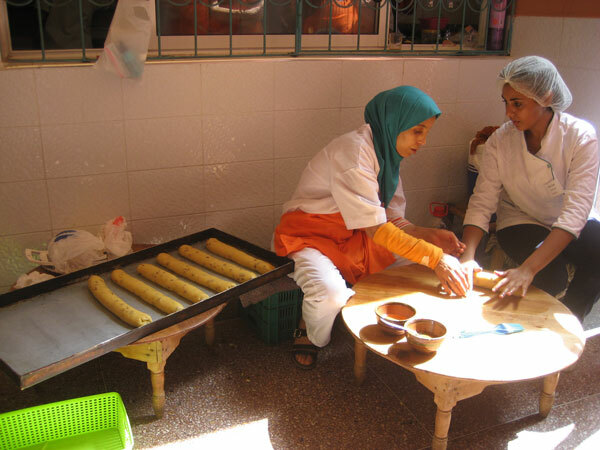 These two women were making a type of Moroccan biscoti for the bakery. 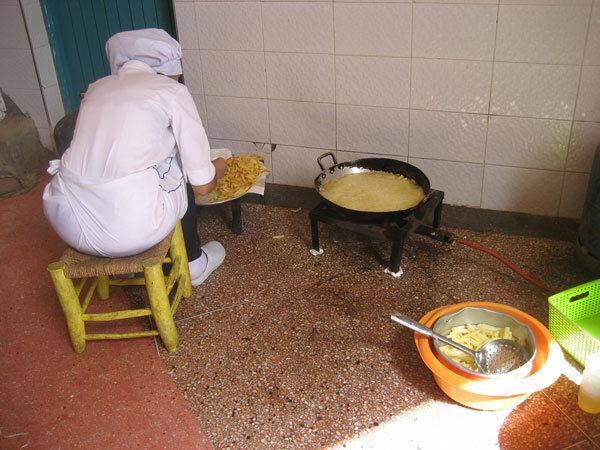 This woman is making French fries (chips). The oil-filled pan is sitting on a free-standing gas burner connected to a bottle gas tank by the red tube. 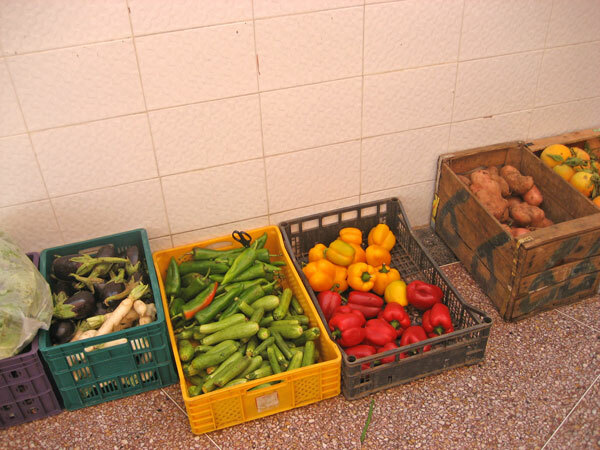 These are the vegetables that were delivered for the class and for lunch service. This is our teacher with everything lined up for our cooking class. 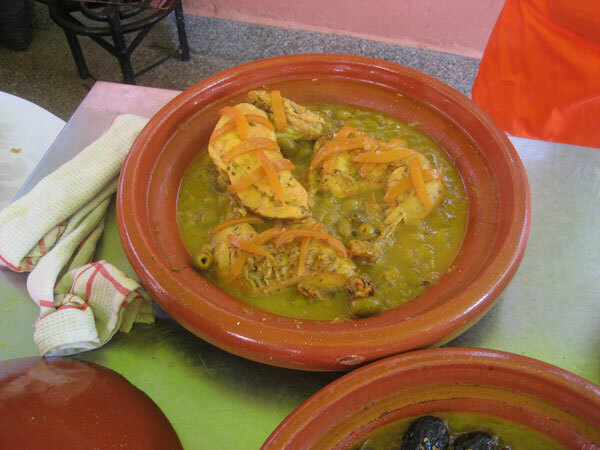 Because we were 9 people we were able to cook 3 separate dishes: 2 tagines and 1 couscous. 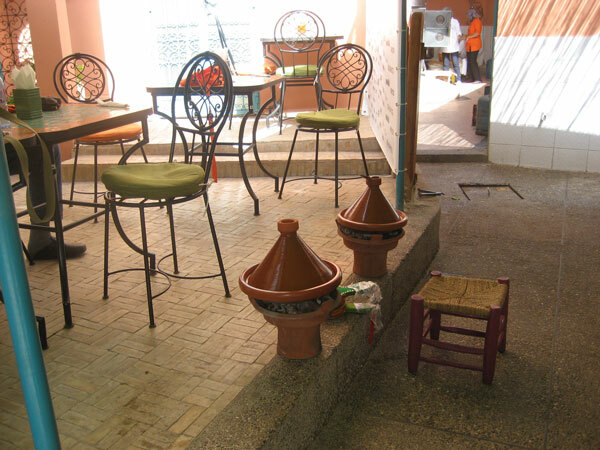 The tagines were cooked over charcoal and the couscous over a stand-alone gas burner. Note the little stool and bellows used to fan the coals. We made a Chicken and Preserved Lemon Tagine. She used the pulp as well as the rind of the lemons. All of my cookbooks say to discard the pulp. I’ll use it all next time. 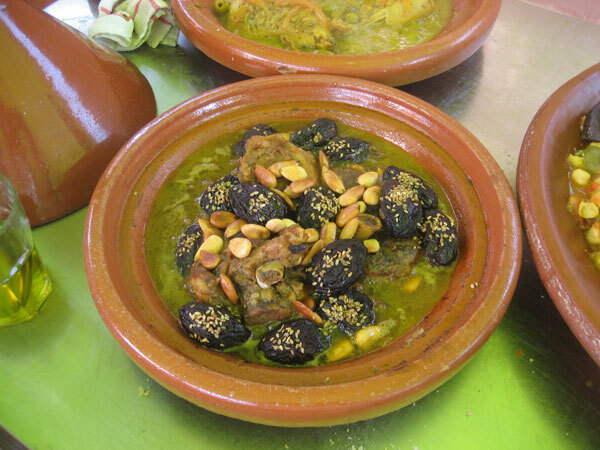 Also a Lamb, Prune and Almond Tagine. We were all amazed by the amount of olive oil that went into to all of the dishes. For me the couscous dish was the most, er, educational. 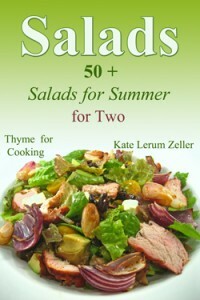 All of the long vegetables, carrots, zucchini, eggplant, leeks, etc. were simply cut in half the long way before being added to the pot. They were boiled in water in the aluminum couscousiere you can see in the prep. photo above. But the couscous itself was really interesting: First it was rubbed with a few tbs of olive oil for about 5 minutes with fingers. Then it was steamed over the cooking vegetables for 10 minutes. It was taken out of the steamer, tossed to cool down a bit then rubbed with a few more tbs of olive oil, again using fingers. It went back in the steamer and the whole process was repeated 2 more times. The rest of the vegetables – tomatoes, chickpeas, garlic, as well as the herbs and spices were all combined and spooned over the finished couscous. Thankfully they gave us all copies of the recipes – although we’ll just have to remember the techniques. Wow, all looks amazing. The couscous method is fascinating when all my life I have just opened a box and poured the grains into boiling stock. Katie the food looks amazing. What an interesting process for the couscous. I have a Lebanese friend, and they too use a lot of olive oil…their food also tastes great! 1. About how much olive oil was rubbed into the couscous before it was steamed? 2. 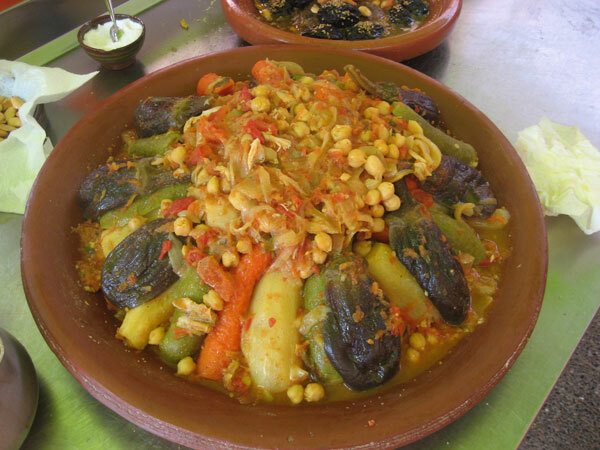 Did they talk about whether it was better to have glazed or unglazed tagines? 3. Is there really no hole in the top of the tagine lid? Kate, I was fascinated by the couscous…. Zoomie, thanks – it was fun. Ina, it was fantastic – and lots of olive oil. sullimaybe, it was – and delicious. Wow! That IS lots of olive oil! I guess we’re going to have to try that to see how it tastes. 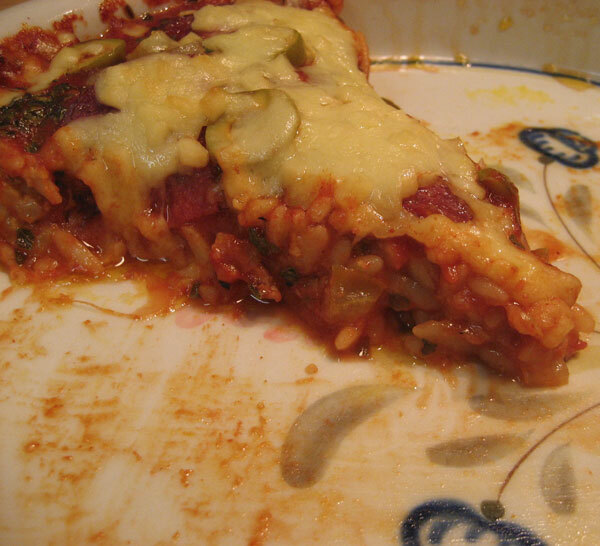 Pingback:Salami Pizza with an Orzo Pizza Crust.